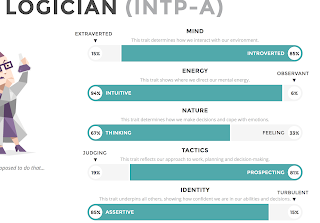 Xykademiqz's interesting post on her MBTI type has me thinking about how personality or certain traits or however you want to define it affects how we work. It turns out that we're the same type (INTP), and boy howdy, did her post resonate with how I approach planning. I'm looking forward to her next post on the subject and to participating in the comments. 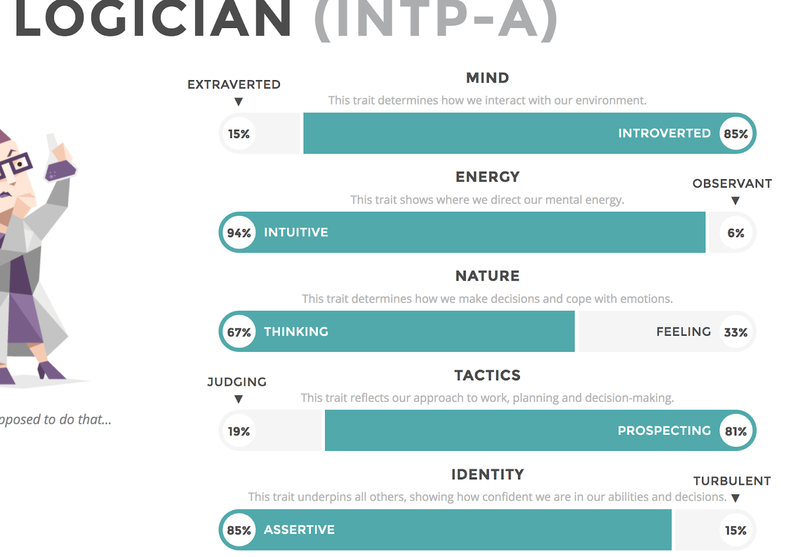 Here's a link to the test she posted https://www.16personalities.com/free-personality-test and my result (at right). I first took the official version of test on paper years ago as a process of figuring out job search strategies or something and then took it online a few times. Have I changed over the years? Uh, nope. As I mentioned over at her place, something about planning (is it on the P scale of the test?) makes this type feel trapped. That doesn't apply to work--I can lay out a course, a class, an admin task, etc. and follow through just fine--but to plan out life stuff (especially writing) in this way just doesn't work. To me, planning dinners like this seemed bonkers, and it made me itch just to think about it. How would you know whether the asparagus was good that week? What if you didn't want to eat tuna casserole on a Friday six months hence? I've tried this kind of planning for even a week a few times, and I always rebel and switch up the days. There's nothing like knowing that you have to do something to make you rebel against doing it. And that, right there, is why those posts about making lovely little check boxes that xykademiqz links to and making a timetable for something like writing is so tough to do. I can admire it, but I can't really do it. The most I can do is to draw a line down the right-hand margin of my little black book and list a few tasks that I hope I can get through that day. Here's another visual aid about how I start writing: watch Ed Norton (Art Carney) as he sits down to play the piano. Yeah, that's me. We're getting good at keeping track of time, my little black notebook and I. Yes, it took me 7 hours to do that administrative task. It takes what it takes, but the thing is, I can't feel despairing because I wasted the day. It's not wasted. It has to be done. My notebook tells me how I spent that day when I'm beating myself up mentally about not writing more. Receiving a long, detailed, multi-part email about non-urgent minutiae? How long will it take to read and respond? My notebook tells me. It's a number, that, anonymized, averages out to "too long." Bottom of the reply list for it. I send an email that doesn't receive a response but receive more non-urgent minutia-driven emails. Do I hasten to reply? I see from my notebook that this was discussed already with the person sending the email. I let the email sit for a while. Meeting that's supposed to take two hours and we're only 2/3 of the way through the agenda? Unless the president or provost has convened it, I'm leaving at the end of two hours. This is the 70% rule that xykademiqz and gwinne have talked about. Document, document, document those progressive emails. X writes to say "I need you to break this rule for me" sent to someone not me. I reply to the person who forwarded it saying when X contacts me, I'll respond. X writes to someone not me to say, "hey, could you get on this right now? Time's a-wastin' here!" Same answer. When X contacts me, though, I'm ready with a reply. The To Do List is in the little black notebook as well as in the spreadsheet. It's more satisfying to cross things off in pen than in a spreadsheet. The spreadsheet only tells me when I didn't meet a goal (as in Paul Silva's How to Write a Lot) or how many words I wrote. The notebook tells me that I didn't get home until 9:15 p.m., which puts a little different spin on what looks like a wasted writing day though it was a useful campus one. Because it also holds some drafts and bibliographies all in one place, I can tell when I've added something to a main document: the transferred material has a line through it. In the notebook, I can trick myself into writing with pen and paper sometimes when the computer holds too many other distractions (grading, etc. ), as Dame Eleanor talks about. And every day when writing happens, there's the number of words, circled, at the top of the page. Pasting or stamping gold stars to the page might be a step too far, but I don't need them anyway. The circled numbers are enough.